New Meijin League gets under way; Kansai Ki-in moves: The first games in the 41st Meijin League were played on December 3. In a match-up between heavyweights, Takao Shinji 9P (W) beat Yamashita Keigo 9P by resig. Ko Iso 8P (B) beat league newcomer Hirata Tomoya 7P by resig. On December 10, Cho U (W) beat Hane Naoki 9P by resig. On December 17, Murakawa Daisuke (B) beat Uchida Shuhei 7P by resignation, completing the first round. Incidentally, this was one of the last games played at the headquarters of the Kansai Ki-in in the Nihon Bunka Kaikan (Japan Culture Hall). After 47 years at this venue, the Kansai Ki-in is moving to a new address: 4th & 5th Floors, Heiwa Building, Kitahama Itchome, Chuo-ku, Osaka 541-0041. 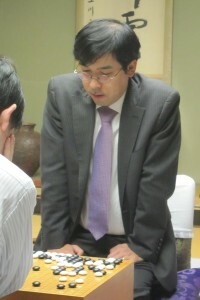 Hane defends Crown title: The final of the 56th Crown title, which is open to Nagoya professionals, was held on December 4. Taking white, Hane (right) rebuffed the challenge of Ogata Masaki 9P, forcing a resignation after 150 moves. This is Hane’s fifth Crown title in a row; overall, he has won it 12 times. That takes his tally of titles to 25, which is ninth in the all-time records. Yoshihara to challenge for Women’s Kisei: The play-off to decide the challenger to Xie Yimin for the 19th DoKoMo Cup Women’s Kisei title was held in the Ryusei Studio in the basement of the Nihon Ki-in at Ichigaya on December 7. Yoshihara Yukari 6P (W) defeated Kato Keiko 6P by resig. Yoshihara (left) won this title three times from 2007 to 2009, then lost the next two matches to Xie. At present, Xie has held the title for three years in a row.